The creators of Chinese gardens throughout the centuries have created the beautiful imperial gardens of Beijing as well as the gardens of Shanghai and Suzhou. Their artistic influence, infused with Chinese culture and history, and then later married with the aesthetics of the European Enlightenment, can also be seen in the contemporary landscape designs of today in China and abroad. 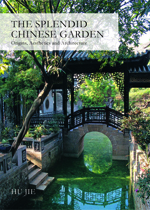 Professor Hu Jie, who studies, works, and teaches extensively in both China and the United States, and renowned for the much acclaimed Olympic Park in Beijing, surveys the celebrated classic and modern gardens of china in this new book for the Western landscape architect and the amateur gardener. The Splendid Chinese Garden examines the essential genres of gardens—the imperial garden, the mausoleum garden, the temple garden, the residence garden, the scenic spot garden, and the literati garden—in breathtaking pictorials and detailed descriptions of the artistic and historical influences that guided their designers. The careful explanations of such gardens give insight to Chinese garden building techniques in ancient times as well as an understanding of a culture’s philosophy and aesthetic.